Adult Female and Nymph Deer Tick, Courtesy of Griffin Dill, UMaine Cooperative Extension. Have you ever felt The Fear? Have you ever felt the gripping, nauseating fear that comes with finding a tick burrowed into your skin? 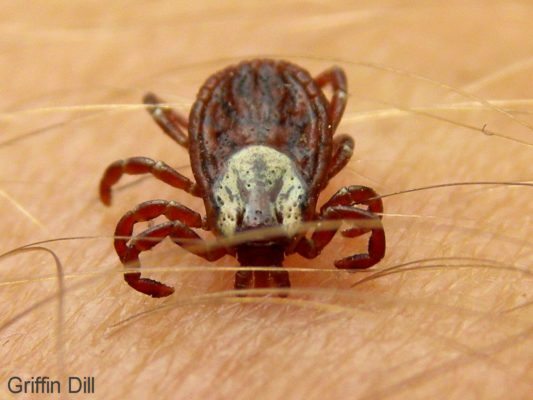 Aside from the obvious ickiness of having an arachnid bite you, the fear of the disease that can be spread by ticks is very real, and the results can be debilitating. It is almost impossible to think about ticks and not think about the dreaded “L” word; Lyme disease. Yet, as with most things, knowledge is power. Got Ticks? Call a knowledgeable licensed professional at 1-800-323-PEST or contact us to request a FREE Quote, ask us a question or Schedule a Service! Fortunately, most of these ticks do not transmit diseases to humans. Lyme disease has been shown to be spread primarily through the Deer Tick, which is also known as the Black-Legged Tick. 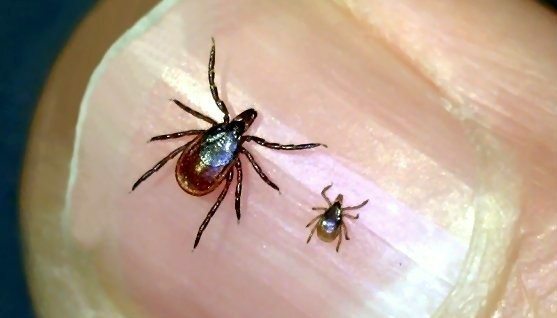 It has been estimated that up to 25% of all Deer Ticks nymphs‘ (immature ticks) and up to 50% of adult Deer Ticks are carriers of Lyme Disease. However, ticks can appear similar to the untrained eye. so it is still critical that we be able to differentiate between the types, as there are other diseases and infections that can be spread beside Lyme. Adult Dog Ticks are about 1/4 inch long, however, the males are typically a bit smaller. A key feature between males and female dog ticks are the intricate hexagonal dark area above the head of a female. Female American Dog Tick, Courtesy of Griffin Dill, UMaine Cooperative Extension. Male dog ticks attach themselves, but they do not become engorged like the females. 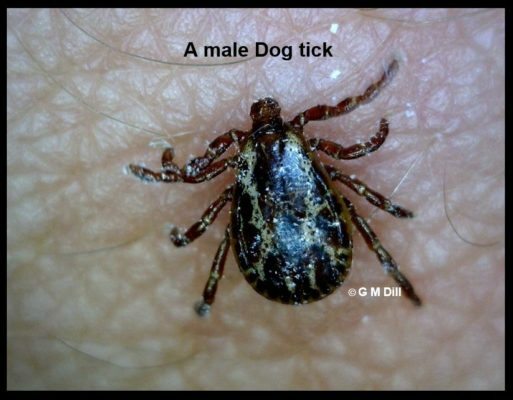 Male American Dog Tick, Courtesy of Griffin Dill, UMaine Cooperative Extension. Adult Deer ticks are about the size of a poppy seed and can be very hard to see. Females deer ticks are brown to reddish-orange, with a dark brown/black area behind their head. Female Deer Tick, Courtesy of Griffin Dill, UMaine Cooperative Extension. Male deer ticks tend to be dark brown without the reddish tones and are slightly smaller than females. Male Deer Tick, Courtesy of Griffin Dill, UMaine Cooperative Extension. 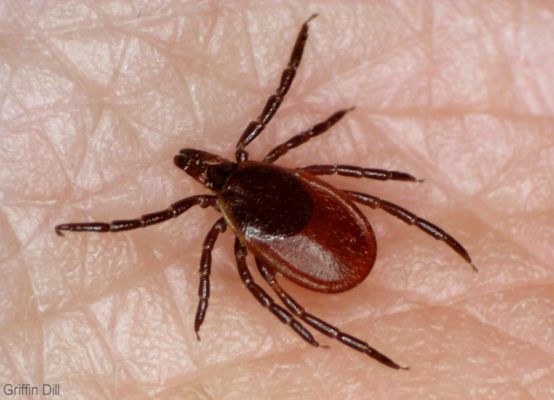 Although we tend to think about ticks only in the summer months, primarily May through August when they are most active, ticks can actually live through the winter and will remain active through much of the year. They can burrow into leaf litter and survive quite nicely until temperatures warm up to a more suitable level. 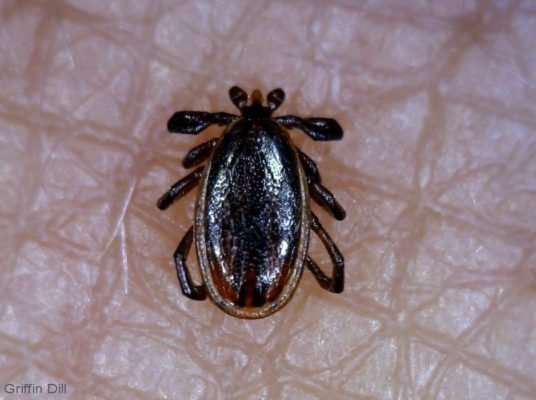 The bite of a tick is often painless, so unless you discover them attached while doing a tick-check, the first indication you may have is a rash over the affected area. Tick rashes can come in a variety of shapes and sizes, and are not always at the site of the bite. They can range from the classic “bullseye” too big blotches of red. In some cases, they many not even show up at all. In the event that you see any of these types of rashes, seek medical attention immediately. Lyme is very treatable, especially if caught early. Ignored, it can be debilitating. If you, your family, or your furry four-legged family members encounter ticks on your property, give us a call at Modern Pest Services. Let us treat your yard for ticks, (as well as mosquitos), creating a barrier of protection for you and your loved ones. Enjoy your summer without worry! Do you still have The Fear? Maybe you do – take comfort because we know how to squash that fear like a bug! Special thanks to the Center for Disease Control and the UMaine Cooperative Extension: Insect Pests, Ticks, and Plant Diseases, in Orono, ME, for their photos and information. If you find yourself waging war against ticks, Modern Pest Services can help. Our Mosquito & Tick Control provides two services for the price of one! Our program consists of 5 monthly treatments between May and September and has been proven to effectively reduce both tick and mosquito populations – guaranteed!